We’d love your help. Let us know what’s wrong with this preview of Home Economics for Girls by J.P. Wright. A country house murder mystery of sorts, for daughters and their mothers, and anyone else who wants to learn the correct way to eat a scone. Violet has to prepare for her Home Ec assessment, but with a house full of guests and a lunatic sister playing at detectives, how will she ever get it done? And if the dog did not destroy Mother's cake, who did? Did she really see som A country house murder mystery of sorts, for daughters and their mothers, and anyone else who wants to learn the correct way to eat a scone. Violet has to prepare for her Home Ec assessment, but with a house full of guests and a lunatic sister playing at detectives, how will she ever get it done? And if the dog did not destroy Mother's cake, who did? Did she really see someone lurking down at the gatehouse? Which one is the bay tree, and what does nutmeg look like anyway? Should self-confessed teachers be allowed out into society? All these questions must be answered before the weekend is over. To ask other readers questions about Home Economics for Girls, please sign up. Loved this! I want to buy it for my niece. Doesn't say the genre or age group but it felt like a cozy mystery or similar to Nancy Drew. Adorable! Received by Audiobook Reviewer in exchange for an honest review. Being a child is hard, but growing up with a little sister can be downright annoyingly frustrating. J.P. Wright has a humorous, whodunit story...chalked full of sibling rivalry, child detectives, and mystery. The drama that unfolds within these pages will have readers laughing and shaking their heads in a knowing fashion. Violet Tickham comes across a violent crime at the start of the book; someone has destroyed her mother's decadent and infamous Chocolate Cake! With only Marcus, their dog at the Being a child is hard, but growing up with a little sister can be downright annoyingly frustrating. J.P. Wright has a humorous, whodunit story...chalked full of sibling rivalry, child detectives, and mystery. The drama that unfolds within these pages will have readers laughing and shaking their heads in a knowing fashion. Violet Tickham comes across a violent crime at the start of the book; someone has destroyed her mother's decadent and infamous Chocolate Cake! With only Marcus, their dog at the scene of the crime, her younger sister Tabitha comes in at that moment to suspect her of foul play. Now, with guests coming over for their mother's murder mystery party, a house full of guests may deter them from their important task. Violet has a Home Economics dish to make, which she has no idea where to find some of the ingredients and doesn't let her mother know about the assignment until much too late...all because of her having to watch her snooty, little sister! Tabitha has designated herself detective on the case! She secretly knows that her sister didn't do it, but likes to goad her into thinking she did for the pure enjoyment of getting under her sister's skin. She is determined to find out who did destroy the cake and get to the bottom of the mystery once and for all. Wright has an interesting take on murder mystery, while the narrator was very entertaining and brought a lot of life to the story. This is classified as a cozy, but does have a somewhat satirical sentiment, based on the thoughts and emphasis of two young sisters. The pace is very quick and the vocal portrayal is superb. If you are a reader of cozy mystery and satire, you may want to try this one out. A copy of this audiobook was provided to Turning Another Page by Audiobookworm Promotions, but this in no way affects our honest opinion of the book or the review that has been written. 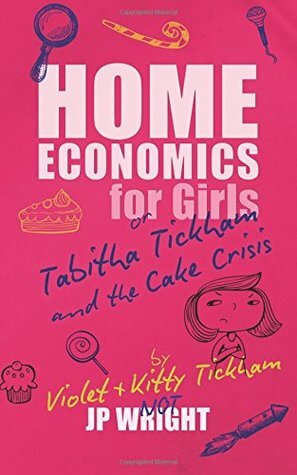 We provide a four-star rating for Home Economics for Girls or the Tabitha Tickham and the Cake Crisis by J.P. Wright, narrated by Claire M James. Excellent story, great writing and engaging characters. It wasn't what I was expecting and I loved it. Within a page of starting Home Economics for Girls I had slowed down to approximately the reading speed I use for people like Kant and A.J. Ayer. Not that it's hard to follow, at all - but there is a level of enjoyment above which one just has to prolong the experience, and I didn't want to miss a syllable of this wonderful book. Tabitha Tickham is a wonderful character, with something of the quality of a catherine wheel that's not been adequately nailed to the fence. You do not know where or how Within a page of starting Home Economics for Girls I had slowed down to approximately the reading speed I use for people like Kant and A.J. Ayer. Not that it's hard to follow, at all - but there is a level of enjoyment above which one just has to prolong the experience, and I didn't want to miss a syllable of this wonderful book. Tabitha Tickham is a wonderful character, with something of the quality of a catherine wheel that's not been adequately nailed to the fence. You do not know where or how she will explode next. Despite this larger-than-life quality, she is eminently believable, as is her older sister, the serious and faintly pompous Violet. There's no false sentiment here - they are depicted with ruthless honesty and a deep understanding of what childhood is really like. Violet may or may not be fat and smelly. We do not really know whether her little sister's gibes are fair comment, or merely the taunting of a pre-pubescent sibling. Similarly, we do not really know what Marcus looks like, and yet he is unmistakably there, a massive, sighing, philosophical houndish presence. This was one of the things I particularly appreciated about Wright's work; very seldom is anything really described in any detail, yet the entire book has a richly visual quality. The reader is allowed to supply. To do this, and do it well, requires a sureness, a lightness of touch and a mastery of language that is rare in any case, but extremely rare in a first novel. There's a madness to the sequence of events, a dreamlike inevitability that tells us that of course a cake left on the window sill to cool will be knocked out of window; what else? I thoroughly enjoyed this clever, funny, and well-constructed story. Full of wonderful characters, brilliantly drawn scenes, and witty dialogue - this book will keep you entertained all the way through. Told through the eyes of sharp-eyed young sleuths (the Tickham girls), the suspense and excitement of the unfolding drama will surprise and enthral any reader who enjoys a funny and well-written 'whodunit'. Beguiling, sagacious, and thoroughly good fun. There are few review about this one but they are in general extremely positive. Somehow I expected to enjoy this audiobook much more than I did. For starts, there is changing POV's, completely unannounced. The story is told by the two sisters, who see the whole mystery and family affairs in a very different light. The book is written in a humorous tone, but the constant ramblings of both sisters got me tired really fast. I also found the book frivolous and very judgemental, and the adjective fat There are few review about this one but they are in general extremely positive. Somehow I expected to enjoy this audiobook much more than I did. For starts, there is changing POV's, completely unannounced. The story is told by the two sisters, who see the whole mystery and family affairs in a very different light. The book is written in a humorous tone, but the constant ramblings of both sisters got me tired really fast. I also found the book frivolous and very judgemental, and the adjective fat is often used as pejorative. There is a completely lack of descriptions, but even like that the action is very slow, since it is constantly interrupted by numerous and unrelated ramblings. I found it very distracting and I kept zoning out throughout the book. Claire M. James narration was good, but she made no difference between both sister's voices, which made more the story more difficult to follow. She also used a super theatrical tone, overdoing the characters' interpretations, that went well with the book, but was really tiring for me. I finished this book because I was curious of the outcome, but sadly, it's not one that I would recommend. It made me laugh as it has so many hidden humour. I love the beautiful scene description. This book is well written by the author, in terms of the grammar, sentence structure. If you would like to have a relax day or learning correct standard English, this is the right book for you.